With the Horrible Science Explosive Experiments you can run experiment after experiment, all with one goal - to investigate stuff that explodes! 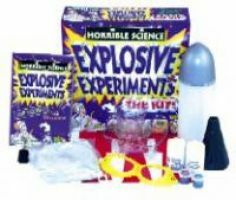 Make and launch your own rocket, watch a volcano that really erupts, even experiment with some delightfully slimy snot. Learn how to do it all, and more explosive facts, in the top-secret Lab Notebook that comes with it - just make sure you KEEP it secret. We call it that for a reason.